It is Casablanca, 1942. 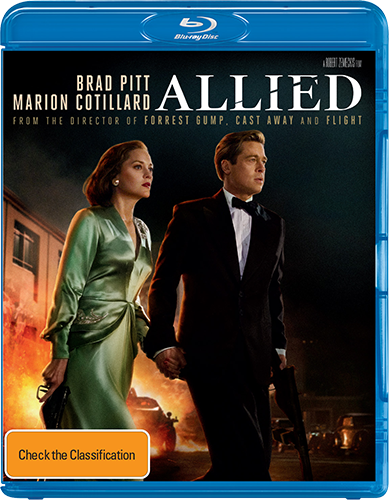 Allied counter intelligence agent Max (Brad Pitt ('World War Z', 'Inglorious Basterds') assumes the identity of husband to famous French resistance spy, Marianne (Marion Cotillard, 'Assassin’s Creed', 'Two Days, One Night'), who is also working undercover. The pair effortlessly poses as a married couple while covertly colluding to assassinate a German diplomat. After the dangerous North African mission is over, they renounce their espionage days, marry and relocate to lead a quieter life in England. The pressures of war threaten their relationship as evidence comes to light that Marianne may be secretly conspiring with the enemy. When Max learns his wife is likely a Nazi spy, he has only 72 hours to prove her innocence and save his family before he has to do the unthinkable. The intricately woven story by Robert Zemeckis of two star-crossed lovers entangled in enemy lines revisits the romantic espionage genre of eras gone with an immensely mesmerising and smouldering chemistry from Pitt and Cotillard. Be swept up in the intense race against time that tests the limits of one man’s love for his family against that of his country in 'Allied'. The 'Allied' competition has now closed. Winners will be announced shortly. Competition opens at 5pm AEST on Sunday 23rd April 2017 and closes at 11:59pm AEST on Sunday 30th April 2017. Five winners will be chosen at random on Monday 1st May 2017. To successfully win, entrants must fulfil the above entry conditions before the time the competition closes. Current members/followers are eligible to enter the competition. Only one entry per person. Only one winner per household. To be a valid winner, the entrant must not have won a prize from SWITCH within the last 28 days. Each winner will receive one Blu-ray copy of 'Allied'. By entering, you agree to receive occasional emails from SWITCH in the future. If you decide to unsubscribe from these updates, any further entries will not be applicable. Only Australian residents are eligible to enter. 'Allied' is available on 4K Ultra HD, Blu-ray and DVD on Wednesday the 26th April 2017 from Universal Sony.